The minute the storms of May were over, the summer hit us in all of its typical North Texas heatwave glory. With the playgrounds too hot to play on in the afternoon, and in an effort to entertain my two little ones, tucker them out and not break the bank, I began a “Tour de Splash Pads: DFW edition”. 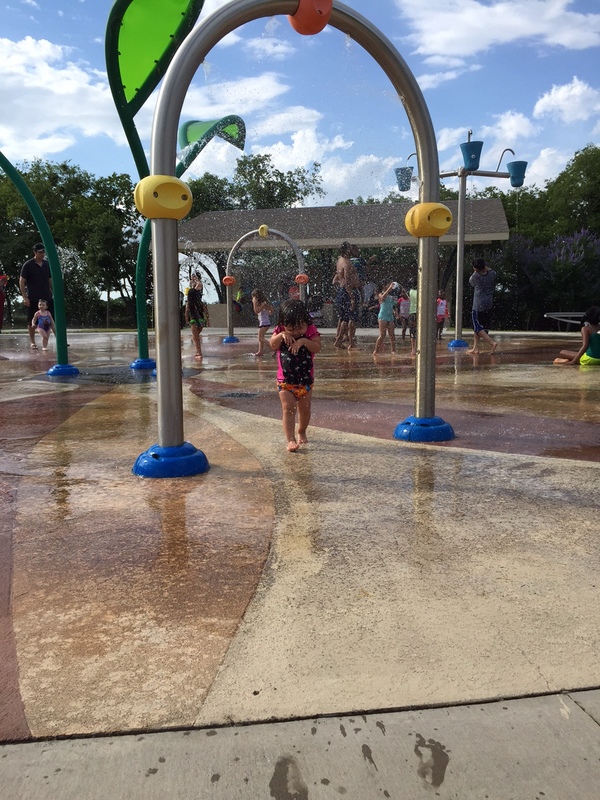 With the help of this extremely extensive listing of splash pads in the DFW area, we set out on our mission and have visited twelve on the list. Of those, I have reviewed the ten which are worth a visit. If you think like me, it can be hard to gather the specific pros and cons from a Google image search, but you want to make sure the trip is worth your time before making the trek. Therefore, the following is my take on what to expect should you choose to venture to any of these DFW-area splash scenes. Additionally, the video with location tags and this Google map contain the location of each splash pad along with some notes, to make it easy to navigate. Over the course of our visits to various splash pads, I have identified good features and not-so-good features of a splash pad. According to these features, I have rated and ranked in order of our favorite visit to least favorite visit. Good features include things like restroom facilities, and features of the splashpad which make the pad more interesting for the kiddos (or for Mom). For example, features such as a slide, water guns, or a great playground next door are all features which help to hold your children’s attention longer and give them more to do in the water and out of the water. Splash pads which are ranked lower on the list were lacking in said features when compared to those higher on the list. Trust me when I say this, when there is water and splashing involved a good bathroom really goes along way! Hence, splash pads with bathrooms scored double points in my mind. Each and every one of these splash pads is FREE to enter, with the exception of one (The Fort Worth Zoo). They are zero-depth meaning they only have a residual amount of water on the ground from the spray features. Watching small children around the pool can be nerve-wrecking so I love hanging out at splash pads because they provide a great water-tainment option for the kids and I won’t pull my hair out due to worry over drowning. OK, are you ready? Here it is! Hint: Be sure to check out the link for each splash pad to get specifics on location and hours. Most of them run seven days a week from morning to early evening, but hours do vary. This one is a bit of a drive for me coming from Fort Worth, but I have to say it is totally worth the drive if you are up for a little day trip. Some of the biggest pros are that it is very clean, has a nice restroom facility, and rows of covered picnic tables. Additionally, it holds my kids’ attention for hours with the wide variety of features the splash pad boasts including a water slide, a tunnel wave and a little river running through the splash pad. And best of all, it is FREE. I wouldn’t necessarily recommend this one for older kids, but for mine (ages 4 and 2), we have been able to make a full day out of it. It’s basically like a little mini water park which is perfect for toddlers. Just pack a picnic, take a few bucks for the popsicle cart guy and you are golden. Parr Park in Grapevine ranks number two for similar reasons. This park is nestled among a very nice greenbelt-surrounded park in a neighborhood in Grapevine, and the park sits back well away from the parking lot (another great bonus). The splash pad sits right next to a VERY large playground. Additionally, there is a special interactive music game within the playground. The park features plenty of nice, large shady trees and nice restroom facilities. With a good amount of shaded picnic tables there are plenty of great places for Mom to pop a squat while the kids run off their energy. If you don’t take lunch and are looking for a place to stop on your way home, I recommend checking out So-Cal tacos just before getting back on the interstate. After a long day playing at the park, their street-style tacos really hit the spot. Yum! Also in Grapevine, Dove Park makes number three on the list because of the clean facilities, excellent restroom facilities and wide variety of play options. Honestly, it really is sort of a toss up between Parr Park and Dove Park. The splash pad at Dove park is directly next to a public pool which has a very nice toddler/baby play pool area. The splash pad sits within a separate gate and is free to enter. The pool is just a few bucks, I believe. What I love the most about the Dove Park splash pad is that it is gated so you can easily corral the little ones, and it has reclining pool chairs which sit underneath a sun shade. This is by far the best seating situation for Mom while The Littles splash and spray. With the gate, shade and lounger, you can sit back and sip on an iced coffee while reading a magazine; the kids can have a blast standing under the huge water bucket which dumps about every five minutes. An additional feature of Dove Park which ranks it top on the list is Casey’s Clubhouse which is directly next to the pool/splash pad area. We like to get wet first at the splash pad and then wrap up the adventure with some treehouse climbing. If you haven’t ventured to Klyde Warren Park yet, I highly recommend it because this park has something fun for everyone. Built in the center of the city of Dallas, atop the highway, Klyde Warren offers many facets of entertainment within the park. Because it is located close to the museum of art and the FREE trolley car stop, you can easily make a whole day trip out of a visit to Klyde Warren. The children’s play area features plenty of things for little monkeys to climb on, a treehouse-like structure, interactive fountains and a restroom facility. Outside of the children’s grounds, the park has a large spray fountain at the very front of the park and two additional smaller fountains midway through the park on each side. The hubs and I have even made this a great “family date night” by taking the kids to splash and taking a side of cheese and wine with us to enjoy while sitting back and watching The Littles. And, if you get hungry for lunch or dinner, a long line of food trucks lines one side of the park. I will say that my only complaint about Klyde Warren is the parking. Be prepared to pay for parking in the garage or a lot nearby (about $10). Every once in a while you get lucky with a street spot but don’t bank on it. The splash pad at the Fort Worth Zoo is first class. However, it doesn’t rank top on the list for a couple of main reasons: 1.) You do have to pay to enter (even members have to pay $4 a head including adults) and 2.) the amount of water which sprays out of the water is a little overwhelming. If you do not have a zoo membership, be prepared to pay for entry into the zoo AND entry into the splash pad. Perhaps my biggest complaint is that there is no entry directly into the splash pad for those who do not want to see the zoo attractions. I love the Fort Worth Zoo and have been a member and supporter for five years now, but I do feel strongly that this is something which they need to fix. Like I said though, you get what you pay for and the splash pad itself is world-class when it comes to splash pads. It’s super clean. You can bring in your own coolers to the zoo so you can have a picnic lunch. My kids and I like to spend a little time splashing and cooling off followed by a stroll through the zoo. Also, this one is great for kids who are a little older, like 4-years-old and up because it does have several large water slides. I’ve noticed with my 2-year-old, and in observing other smaller toddlers at the pad, that the force with which the water sprays is a little intimidating and many of them tend to sit on the sidelines a bit more than at other splash pads. Overall, if you have a zoo membership then the cost isn’t too high and I do recommend trying it out at least once, because it is so nice and is really more like a water park with all of the slide attractions. Sycamore Sprayground is one of the most conveniently located to the Fort Worth area because, well, it is in Fort Worth. Located close to Texas Wesleyan University, this splash pad is the one “traditional” free splash pad located in Fort Worth. One of the best features of this splash pad is that it is gated so you can close the gate and keep The Littles corralled. The pad area has a sun-shade for Mom to relax under and set up a picnic, however there is no seating so be sure to bring a blanket or a folding chair. The splash pad does not have a restroom facility, however there is a community center at the park where this is located and I have taken my kids in there to use the restroom and no one has batted an eye. The splash pad operates starting at noon every day, so do plan to make this one an afternoon visit. Also, a popsicle cart guy sets up shop right outside the pad so bring a few bucks if you want to indulge in an icy treat. Located in the Haltom City area, Whites Branch Park is just a stone’s throw away from Fort Worth. With the park and splash pad set very far back from the parking lot, Mom can relax while the kids enjoy the water gun and bucket features of this splash pad. Whites Branch park has a nice amount of shade on one side of the splash pad with a few picnic tables and benches. One drawback to this splash pad is that it does not have a restroom and there is only a portable potty. However, my kids had a great time in the water features, at the park aside the splash pad. They also enjoyed that it was a busier splash pad so there were plenty of other children for them to play and frolic alongside. If you are going to be making a trip up to Ikea in Frisco, I recommend making a day out of your drive and stopping at this splash pad and park before heading home. On a lazy Saturday afternoon we decided to head North to visit the store, try a new place for lunch and also check out a Frisco-area water scene. After our Ikea trip we headed over to Frisco Commons Park which was excellent. The splash pad is sectioned off from the playground, so you do sort of have to enjoy them separately, however the splash area has a very nice pavilion with plenty of tables and shade for your pop-up dining. Right next door to the splash pad is a GIGANTIC playground. When I say gigantic, I mean GIGANTIC. While awesome and full of adventure, I will say it was hard to watch multiple children in the playground area because it was so expansive and The Littles just love to run off in different directions. C’est la vie. If you are in the Arlington area, I recommend checking out Don Misenhimer Park. It does not boast a large splash pad, however it does have some features which are fun for the kids and different than most of the other splash pads we have visited. With a seal that squirts water, a whale water slide and a very nice playground which sits right next to the splash pad, kids can go from water to climbing and back again until they are worn out. This splash pad really is ideal for younger toddlers. This park does not have any restroom facility so be sure to tinkle before heading over there for your adventures. Next to the splash pad there are a few benches, some covered picnic tables and a nice stone wall for Mom to sit and watch as The Littles romp. Last on the list is the Sundance Square pavilion in downtown Fort Worth. While I absolutely love this area of the city and am so amazed by what they have done to make this area more pedestrian friendly, it ranks last on the list for a few big reasons. First, the hours are rather limited for splashing. The hours during which children can splash in the fountains are limited to 2pm to 6pm. Secondly, bathing suits are not allowed. I get it; they have put a great amount of effort into making the scene romantic and adult-friendly so they don’t want the fountain to turn into a water park. However, just be prepared if you are going to venture downtown for some splashing followed by dinner: take an extra change of clothes to put Your Littles in after their water romp. While these are some pretty big negatives for me, there are some features of this interactive fountain which I love. The biggest reason I love it is the location: it is Mom friendly. I enjoy stopping into Starbucks first to grab a Mom beverage and then enjoy sipping my caffeine while the kids run around in the water. Also, the setting is just so beautiful and there is plenty of table seating around the entire fountain area so it is just plain peaceful to set a spell while The Littles run. If your children are older, and you want to grab a taco and a margarita while the kids play, you can sit on the outside patio of Taco Diner which overlooks the fountain area. Sundance Square has a little something for everyone as long as you go in the specific time block and stick to the rules. But, do be prepared for the security guards to put the kabosh on your romping if your kids are not fully dressed. We like to walk on the wild side so it has happened to us just a time or two. Wink. If you found this review helpful, be sure to check out my instagram page to follow along as we continue our Tour de Splash Pad through the remainder of the summer, as well as trips to water parks and pools. To follow along with me on all the adventures, parenting hacks, family budget tips and tricks, as well as all the giggles and cries which come along with motherhood, be sure to check out my Facebook page and click the email follow button on lifewithmother.com.